A Gushing Spoiler Free Review of Star Wars Rebels! I finally have a breather! Yesterday was grueling. Here is a spoiler-free review or impression of Star Wars Rebels premiering on The Disney Channel before it becomes a weekly series on Disney XD. Forgive any typos or errors (more than usual) as I’m on an iPad just trying to get this out to all my Star Wars buds. 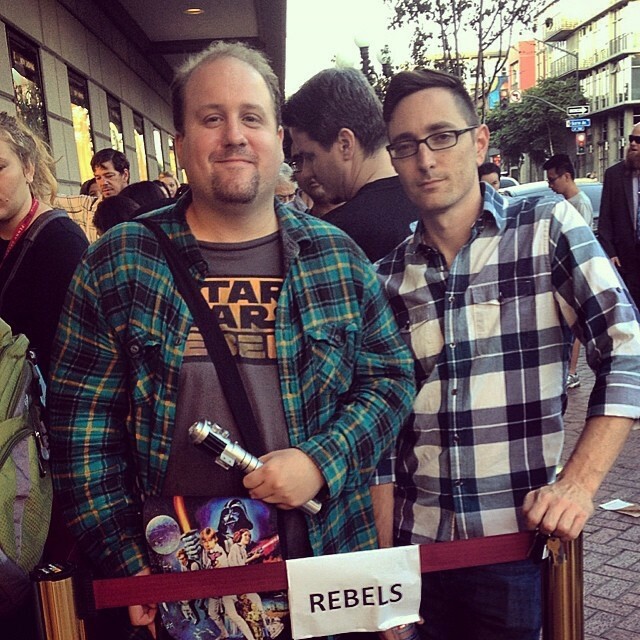 I really wanted to see Star Wars Rebels badly. That meant the ultimate sacrifice. Well, not the ultimate. But I had to wait in line for 8 hours. Only there was no line for Star Wars Rebels and other films were showing at the Reading Cinema like Hercules and Maze Runner. So I got in line for the movie starting at a time I figured would transform into the Star Wars line. That movie went in and I waived people passed me, much to their delight. By the end, I was the front of the line. It was smart too. Because when the line became the Star Wars Rebels overflow line, they only let ten people in. The cut of the opening one hour special of Star Wars Rebels wasn’t entirely finished. It was in no way in shabby shape though. But they warned us some parts of it weren’t finished animation. There was never a moment were it was distracting or anything. I noticed one small shot that I didn’t think the animation was finalized yet. But you know what? It didn’t matter because it was that good. The story was so immersing, if there were any other shots that weren’t done, I wasn’t picking up on them. I was so sucked into the story that I was following the kinetic action on screen. Kevin Kiner’s score. Wow. He sold the show. He did some amazing things in Star Wars: The Clone Wars, especially towards the end when he was recording with the orchestra in Prague. I feel like Star Wars Rebels is the best Star Wars score we’ve ever heard that wasn’t a John Williams piece. If Kiner was scoring Star Wars: Episode VIII I wouldn’t be upset. I promise you, not only is the music going to blow you away, but the entire sound design of this show. As I mentioned on Twitter, Star Wars Rebels has more heart than you can possibly imagine. The show is truly about the characters. You feel for the orphan, you want this new group of rag tag rebels to take him in and to form that made family. We don’t learn everyone’s deep backstory, but we learn enough about the Empire and what it has taken from them that every time they have a victory against an Imperial stooge, you feel the justification. Strangely, I never realized how much I missed gun battles in Star Wars. The gun action is very 80s, so it works well for Star Wars. It is stylized, good guys shoot back, bad guys duck, bad guys shoot back, good guys duck. It is really cool. We had gun fights in Star Wars: The Clone Wars, but they were held a sense of “struggle” that was a little more challenging and grueling, our heroes in Star Wars Rebels don’t have it easy, but they’re good at what they do and they know they can outsmart these Stormtroopers. It is simply more adventure based. The Clone Wars would leave many battles with a sense of “war is hell,” which held onto a certain remorseful feeling about the cost of war. Star Wars Rebels goes in shooting and keeps moving because they have immediate goals. The action is just non-stop. The pacing is quick. When this show airs, if you check a text message you’re going to miss five important things. The show books and it refuses to drag. The show pulls of comedy really well. I have to be honest, sometimes the banter in the trailers and clips made me wonder if this was going to play out like Original Trilogy fan fiction. It doesn’t. There were lots of laughs during the screening. I don’t think any of the jokes fell flat. And the show just had great spirit and personality. Little things like Ezra trying to flirt with Sabine and the way he swiveled in his chair gave it a sense of reality that made our hero work. He’s very likable. I would also like to say that Ezra basically takes his first step into a much larger world and sees the universe for the first time and there’s going to be a whole generation of kids that follow Ezra on his journey like we did with Luke Skywalker, Anakin Skywalker, and Ahsoka Tano. We see Ezra’s first time in space and I know this is going to connect with little kids in a major way because I felt it connecting with “inner child” if you will. Star Wars has a lot of dimensions. There’s more than one way to tell a Star Wars story. I think the way Star Wars Rebels is telling their tale is going to connect with the most people out there. In Star Wars: The Clone Wars things that happened mattered. You could intergalactic history unfolding on a large scale. When Palpatine takes over the banks, that’s huge. When Mandalore is taken over by the Sith, that’s large. The Clone Wars was about galactic wide conflict. It was almost The History Channel of Star Wars storytelling. Star Wars Rebels will do no such thing. That doesn’t mean it won’t do huge important thing, but the huge things that happen will be to the characters for the most part. I hope that makes sense. The show is very focused on the characters and it doesn’t seem like it will pullback too much. It will be much more intimate. I don’t think that’s better or worse, just a different way of telling the same kinds of stories. There will probably be less implication about the ramifications of what we just saw because what happens in this story is personal. The show was funny. The characters worked. The characters connected well in the first two episodes. I believe the characters care about one another. I have the sense the characters have true empathy for one another and understand each other because they’ve either been in one another shoes. For being the first Star Wars on screen without George Lucas, I think it honors him well and leaves up to the stellar legacy he left behind. After seeing Star Wars Rebels, I am more confident in new films being great than I ever was before. The only downside to this? I can’t go to my DVR and watch it again right now. I really love Zeb, Hera, Ezra, Sabine, Chopper, and Kanan. They’re great Star Wars characters and we’re very lucky so much care and love went into making this series for us fans.